Asotin County. I've never heard anyone talk much about motorcycling there, other than its crown jewel road, SR 129. The Rattlesnake Grade is a favorite with road riders; if you ever go to Asotin, don't miss its fantastic engineering. Be sure to experience it in both directions. 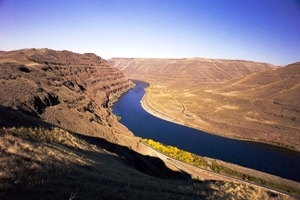 the left and the mighty Snake River below. But we can't create a paved loop within the county from SR 129, so what's a rider to do? 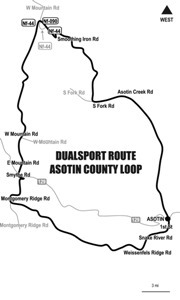 If you have a dual sport, we've got the loop for you. I once spent the night in Asotin, camping out with my friend, Bob Owen (Sasquatch pre-rider/route architect), at Chief Looking Glass park. You're not supposed to camp there, but we were riding the 410/12 Poker Run and the townspeople made it available for one night only. In the morning, Bob went down the Snake River on his GS and I went home to Seattle on my sportbike. Neither of us were aware of this nice loop. It takes less than a tank of gas and about two and a half hours to do this ride. We route it counter-clockwise, but you can reverse it if you like, depending on the weather and time of day. GPS users will find both a route and track file in the downloadable file which you can get here for less than what it costs to get a hamburger. The ride begins in town at the corner of SR 129 and 1st Ave. Head east from there. When the road flows south, it switches to dirt and becomes the Snake River Rd. Most dual sporters continue along the Snake, but for this ride you'll rise up the hill onto Weissenfells Ridge Rd, taking a right at the fork. Climb up until you're greeted with views of Idaho across the Snake River. Continue across the ridge, riding south. to download a printable map with turn by turn directions. to download a universal GPX file for your GPS. When you reach the pavement, turn right onto Montgomery Ridge, follow a few ells in the road, then left onto the gravel of Smyth Rd. Smyth takes you over to SR 129. Cross the highway and continue west onto Mountain Rd. Follow it west for several miles, then turn right onto FS 44 and ride north. You're now in the Blue Mountains and it's time to roll across Smoothing Iron Ridge, a designated wildlife area. On any given day, you may see birds of prey, bear, elk, eagles and big horn sheep. Pack a camera and leave your loud pipes at home. Continue north onto S Fork Rd, down the hill into and onto Asotin Creek Rd. Continue north into town. Tom Mehren is the publisher of Sound RIDER! and author of the numerous northwest touring books including Dual Sport Rides through Western Washington .